Do you remember 1985? I don't. Not really. I was just a young kid at the time. For many of us, it's events that provide our time its context. The birth of a child, a favorite team's glory or that year we went to summer camp. For most of us, we move on to the next year, and the next time and our work, our families and friends and our lives move along with us. For the winemaker, a given year goes on forever, trapped behind cork and glass; picked, pressed, and bottled and representing that particular vintage. Jim Croce said that if he could save time in a bottle... Well Jim, winemakers do just that. The wines don't sit in stasis but rather they evolve over time, realizing a vintage's full potential. I was recently fortunate enough to be invited to dinner with a number of the Willamette Valley's winemaking pioneers, including Susan Sokol-Blosser, Luisa Ponzi, Jim Bernau of Willamette Valley Vineyards and Myron Redford of Amity Vineyards. Throughout the evening these folks shared some of their wines with us, and we walked down their memory lanes. We began where I'd like to end; the Amity Vineyards 1985. From the 2008s of Sokol Blosser and Willamette Valley Vineyards through that 1985, we saw that each vintage meant a story, a lesson or an image that tells a complicated story of hard work, a bit of luck or regrets and lessons learned. The 2008s were the youngest wines we tasted and both examples were so young and aromatically closed up, particularly in contrast with those lively 2007s. Jim Bernau shared that his wine, and the vineyards from which it came was owed in part to Susan Sokol-Blosser who went down to help him plant it in 1983. There was a sense that the connection to the wine and the Valley was also a connection to and an appreciation for one another as well. For 2007, and for what has become known as the Ghost of 2007, (given the initial less than complimentary press that still dogs the vintage), for Luisa Ponzi 2007 was an invaluable experience as a winemaker and grower. "I learned a lot from that vintage, while it's raining, things are still happening in that fruit." Luisa picked some of her fruit before the rain, and she waited on some of it, and therein was the lesson for her. All agreed that those that hung on, and picked later ended up with fantastic wines. While the vintage was given a rough treatment early, the wines are beautiful right now. 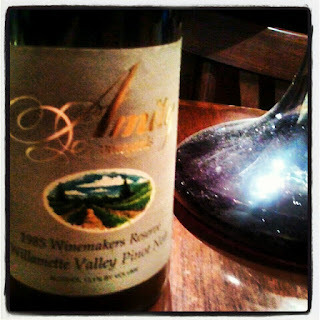 The 2007 Amity had all the forest floor, spice and gun-powdery aromatics that I've come to love about that vintage. The 1999 Sokol Blosser was our lone example of what many call the single greatest vintage in Oregon Pinot Noir. A cool summer led to a bit of trepidation for the winemakers and of course doom and gloom from those wine writer/critic types. All of that was for naught as an extended Indian summer allowed the grapes an extraordinarily long hangtime. The result is complexity, depth of flavor, great acidity and balance and a 13 year old wine that is drinking like it could last an eternity. The Sokol Blosser Willamette Valley Pinot was stunning with bright fruits, great depth of character and a long life ahead of it. The 1985 Amity Vineyard Winemaker's Reserve was the undisputed star of the evening. (Myron decanted it to clear off the sediment.) It was a 27 year old Oregon Pinot Noir, and a history lesson on both the vintage, winery and the Willamette Valley itself. The vines at that time were fourteen years old, a Pinot droit clone used by both Myron and the man whom many consider the father of Oregon Pinot, David Lett. Prior to 1999 it was 1985 that was the gold standard for vintages in the Willamette Valley, and it was because of the 1985 vintage that Oregon Pinot was discovered. For Luisa Ponzi, it was after 1985 that things in Oregon really got going. "It was in 1985 that the press, that Robert Parker and others really stood up and started paying attention to us. 1985 was a big vintage for Oregon." I asked Myron what he remembers that was special about it. "It was a long warm growing season and everything ripened perfectly in the fall. 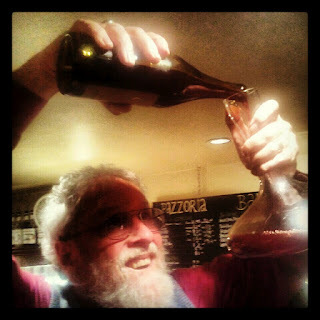 The low pH to brix gave us great, ageable wines." Susan Sokol Blosser remembered 1985 as "her favorite vintage in Oregon." Unfortunately Sokol Blosser lost their library due to heat damage, yet the impressions of 1985 still lives with her. The 1985 Winemaker's Reserve are specially selected for aging. This bottle did so beautifully, tart cherries and raspberry flavors follow classically forest floor aromatics. The wine is a Willamette Valley veteran, and thanks to that vintage it's still singing at 27 years old. Jim Bernauer explained that the low ph levels lead to a high concentration of hydrogen ions. These ions provide a natural defense against oxygen, and the longer the wine is protected from oxygen the longer it can age. "The low pH wines that Oregon produces allow for great natural acidity and that's the key to a wine aging well." The saying goes "Age before beauty," but in Oregon Pinot Noir, you can have both.